You might be misunderstanding. 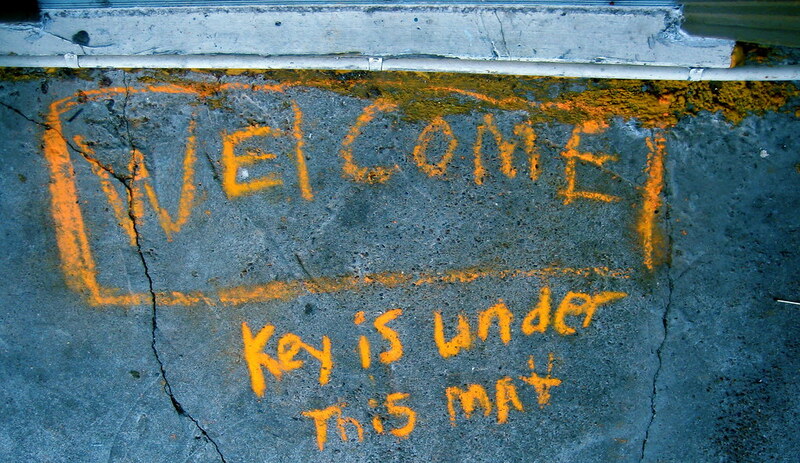 "This mat" refers to the concrete slab. Good luck getting the key. ahhhhh, I wasn’t paying close attention.....EVEN FUNNIER this way!!! Wow welcome to the new members. This is an amazing forum with an equally amazing moderator Erin. She is very much a team player for us and Homeaway as well. Please respect her at all times and refrain from taking out your sometimes very normal fears and frustrations on her. She is here to be a guide and will do her best at all times. You will find many many years of great experience on this site so listen and please participate we want your input too. Even after 30 years I am still learning from others with ideas of proven techniques. Remember, this is your property, your liability, your responsibly and above all your hospitality towards your vacationers. With that being said, you are not a door mat, or the vacationers do not make the rules, you do, you must in order to be successful. Have a strong, legal agreement that is valid in your city and county and add the items that you want respected to your agreement. No one agreement fits all, each one is as unique as the property. Speak directly to each vacationer when ever possible and be clear on your expectations. Provide exactly what you promise. There will be problems, but if you are willing to do the hard work upfront, and all along it can be rewarding, and ....wearing. You are providing a unique home, and not a hotel room. Last but certainly not least, respect your neighborhood and community always. This industry is under fire, due to careless, reckless fly by night management and owners. Lets work to have integrity in all areas of this business. Howdy, folks. Don't be strangers!